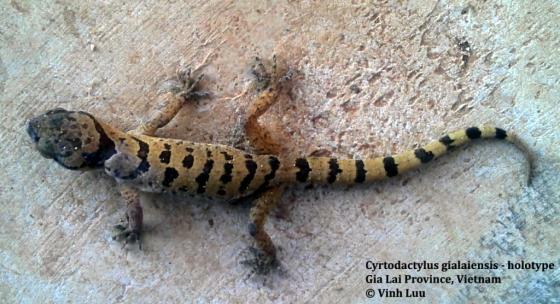 Can you confirm these amateur observations of Cyrtodactylus gialaiensis? Types Holotype: VNUF R.2017.1, adult male, collected on 13 February 2017 by Ha Van Ngoan. Paratypes. IEBR A.2017.4, adult male, VNUF R.2017.4, adult female, ZFMK 100810, female subadult, VNUF R.2017.5, juvenile, same collection data as the holotype. Diagnosis Diagnosis. The new Cyrtodactylus species can be distinguished from remaining congeners by the following combination of characters: Size small, maximum SVL reaching 62.8 mm; dorsal pattern consisting of six or seven dark transverse bands between limb insertions; intersupranasals two or three; dorsal tubercles at midbody in 16–21 irregular rows, strongly developed on flanks; lateral folds poorly defined with interspersed tubercles; ventral scales between ventrolateral folds 38–45; precloacal pores nine or 10 in males, eight pitted scales in the adult female, in a continuous row; femoral pores absent; enlarged femoral scales present; postcloacal tubercles two or three; dorsal tubercles present at first half of the tail; subcaudal scales not enlarged. Comparisons. See Luu et al. 2017: 391 and Table 3. Etymology The specific epithet of the new species refers to the type locality of the new species, Gia Lai Province.